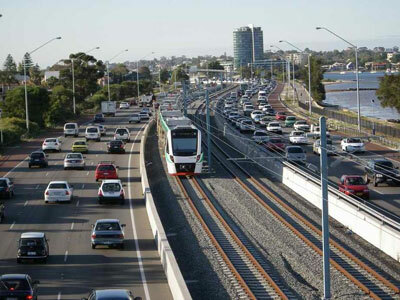 The Perth to Mandurah road and rail interaction features as a case study in the thesis. The need for governments to take into account interaction between different infrastructure projects was the subject of a recent CRC for Construction Innovation study. Mr Wouter Meyers undertook a Masters thesis on the topic, supported by Construction Innovation, QUT and Delft University of Technology in the Netherlands. Essentially Mr Meyers’s thesis sought to identify how infrastructure planning processes can better take into account the interactions between different infrastructure projects. Such interactions can range from the timing of related projects to co-locating infrastructure, or involve interactions between individuals and organisations in the physical network, the stakeholder network and the institutional framework. It may be there are parallel developments from different government departments or different levels of government planned for the same region. The opportunities to maximise outcomes from infrastructure interactions can be demonstrated by Brisbane’s North-South Bypass Tunnel. The Boggo Road Busway is being built in the same area at the same time as the tunnel. The tunnel and the busway cross, so the state government agreed to pay additional money to allow that work to happen at the same time. This interaction is beneficial in that it minimises disruption for road users. Secondly, it saved the construction of part of the structure that would later be demolished when Boggo Road Busway would come in and do their work. Infrastructure is an important instrument for governments to shape and steer the development of a region. However, infrastructure development involves high costs, long life time and long lead time. Infrastructure planning done now is about infrastructure that will be completed ten years of more into the future, so a mistake in planning can result in significant additional costs in years to come. Mr Meyers’ thesis is an important contribution to infrastructure planning. He proposes a framework for the analysis of infrastructure interaction in the master planning stage of infrastructure delivery and the learnings from case studies suggest how bodies coordinating infrastructure planning at a state government level can operate more effectively. Mr Meyers’s study involved case studies of infrastructure project delivery in two states – Queensland and Western Australia. South East Queensland is the fastest growing region in Australia and one of the fastest growing regions in the world – growing by an average of 55,300 people per year between 1986 and 2004. This equates to 1000 people each week. The resulting growth in demand for houses, growth of industry and demand for services places a severe strain on the availability of infrastructure in the region. To tackle these issues, the Queensland government created the Office of Urban Management (OUM) in 2004 to assist in the delivery of the state’s of $80 billion infrastructure program. The OUM released the SEQ Regional Plan and SEQ Infrastructure Plan and Program in 2005 to assist in the long term planning of infrastructure. Similar agencies have been established in other states and, nationally, the Federal Government has created Infrastructure Australia, as a vehicle to identify national infrastructure priorities and develop the policy and regulatory reforms needed to improve the efficient utilisation of national infrastructure networks. One of the main problems facing OUM in Queensland is the coordination between different projects, which are currently developed by different government departments. The goal is to either take advantage of opportunities to combine projects and the resulting infrastructures, or to ensure that projects and their resulting infrastructure do not have an adverse effect on each other. The biggest discrepancy in infrastructure planning is between what is above and what is below ground. Transport infrastructure leads development and is planned through the use of corridors but utilities such as electricity and water are not planned in such a controlled way. Essentially, the transport infrastructure projects are forced to pay for relocation whenever it goes over any utilities. This makes utilities less likely to cooperate with planning processes aimed at taking into account interaction. Another problem is the minimal involvement of local governments in the decision-making process. In Western Australia, the master planning process for infrastructure delivery is well poised to take into account the interactions between infrastructures. Some 75% of the 2.1 million people who live in Western Australia live in the Perth metropolitan region. Perth is heavily urbanised – it is one of the most sprawling and car oriented cities in Australia – and is growing rapidly, with 2.4 million population expected in 2031 (up from its current 1.5 million population). The Western Australian Planning Commission (WAPC) plays a strong coordination role and has produced the Metropolitan Development Plan (MDP) – a five year program for investment in electricity, gas, water, transport and social infrastructure. The master planning process in Perth essentially focuses around land use but is very elaborate in this respect. The planning process becomes more complex – there are more stakeholders, more physical infrastructure and more institutional constraints. Some flexibility in the development of solutions is required due to the fact that when the project reaches the design phase of planning, there will be a lot more interactions to take into account – some of which can be foreseen, some of which will emerge at this (and other) stages. The infrastructure planning process is characterised by a high degree of uncertainty. The project may be cancelled or a political decision may change it. There may be a new development in the region after the project has been initiated, or a change in the economy that renders the assumptions of the project incorrect. Long-term commitment is required as it is often the case that interaction now saves money later, while in order to get a project funded, it needs to cost as little as possible. Also, interaction might not save money for everyone – one stakeholder’s gain might be another’s loss. This is evident in the utility sector and even in the government sector, the emphasis is on individual agency projects, not the whole-of-government outcome. Finally, there are institutional barriers that range from specific laws to company structures. For example, the Main Roads Act is a sate act but the Telecommunications Act is a federal act and, therefore, has the capacity to override other acts. There are differing standards between roads and railways on earthworks which poses difficulties for the co-location of infrastructure. Another institution problem is the different legal status of different corridor reserves.